Living with a cat will give you a whole new perspective on life. Where once your perspective was, “How do I decorate my home the way I want,” a cat will help you realize that it’s far better to decorate your home in the least-destructible way. Any cat owner will soon find themselves squinting at their furniture and wondering A) how will they climb this and B) can they knock it over? Notice the carefully chosen words, “how will they climb this” and not “will they climb this?” Rest assured that if a cat can climb something, they probably will climb it. And that includes your Christmas tree! For many people, the holidays are the time of year when they really learn how acrobatic their cat can be. Even after you cat-proof your home, new furniture, decorations, ornamentation, and especially a Christmas tree can test the limits of your careful planning. A Christmas tree is not only a potential holiday jungle gym full of shiny ornaments and dangly (and dangerous!) tinsel, but it’s also teeming with free snacks in the form of pine needles, which can cause digestive upset or even damage. 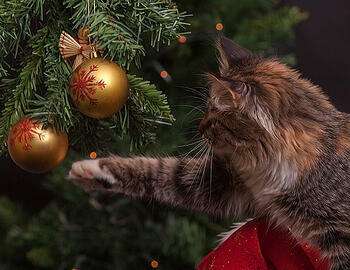 If you want your tree and your cat to make it through the holidays, follow the tips below. Try wrapping the base of your tree with aluminum foil. Many cats hate the feel of foil on their paws and the loud crinkling noise it makes when they walk on it. If you’re worried this will take some of the holiday cheer away from your tree, place the foil around the base of your tree and then cover it with a nice festive tree skirt. See how it's installed in the video below. Note: Don't be tempted to put a shock mat or prickly pad around the base of your tree to keep your cat out. Though such tools may prevent your cat from climbing up your tree, it is more likely that they will cause them distress and discomfort that could lead to problems ranging from peeing/pooping outside of the litter box, stress diarrhea or vomiting, or other destructive behaviors. 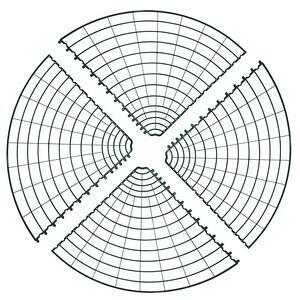 Besides, such tools will do nothing to prevent your cat from launching themselves into your tree from a nearby perch, easily bypassing the shock mat or prickly pad! 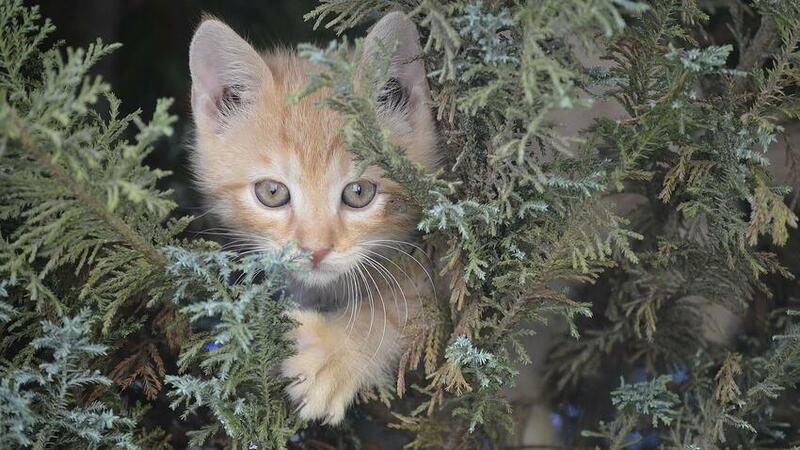 Foil or other defenders might not dissuade your cat from exploring the tree. If that’s the case, you can use citrus spray on and around the tree (NEVER spray on your cat), which can be overpowering to a cat’s sensitive nose and discourage them from getting too close or nibbling on the branches. One quick note: this can cause respiratory irritation to sensitive cats, such as asthmatic cats. You can also use oranges or orange rinds in your tree decorations! Jingle bells, jingle bells, jingle all the... oh no the cat just knocked off all the bell ornaments. A cat in a Christmas tree really can be a hilarious holiday sight — until it's not. 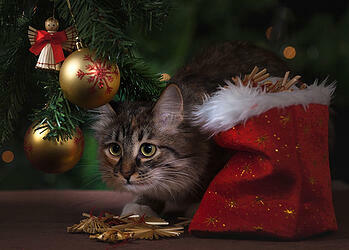 Don’t use tinsel — cats are extremely attracted to the dangly and shiny nature of tinsel. And it’s not only attractive, it’s also very dangerous for them, as it can easily cause a linear foreign body digestive obstruction. Don’t hang ornaments down low where they can easily get to them. Or, if you must, only hang large, sturdy (non-glass/breakable) ornaments there — wood, paper, plastic, burlap, or felt ornaments can be good (unless your cat is likely to mistake any burlap or felt ornaments for their own toys!). And use a very secure way of attaching them to the tree — don’t use regular metal ornament hooks, as they’re (1) not very secure and (2) pose an ingestion/puncture/paw injury risk. Here is one area where it can be good to use twist-ties (like the ones you find on bread bags, or this type of wire tie). The benefit of twist ties on lower ornaments is that you can tie them down tight on the tree to really truly secure the ornaments so cats can’t knock them off. Be cautious though and make sure to twist the ties very tight and secure, as cats can — and have — swallowed twist ties when they get the chance, leading to digestive upset or even puncture due to the thin wire inside. 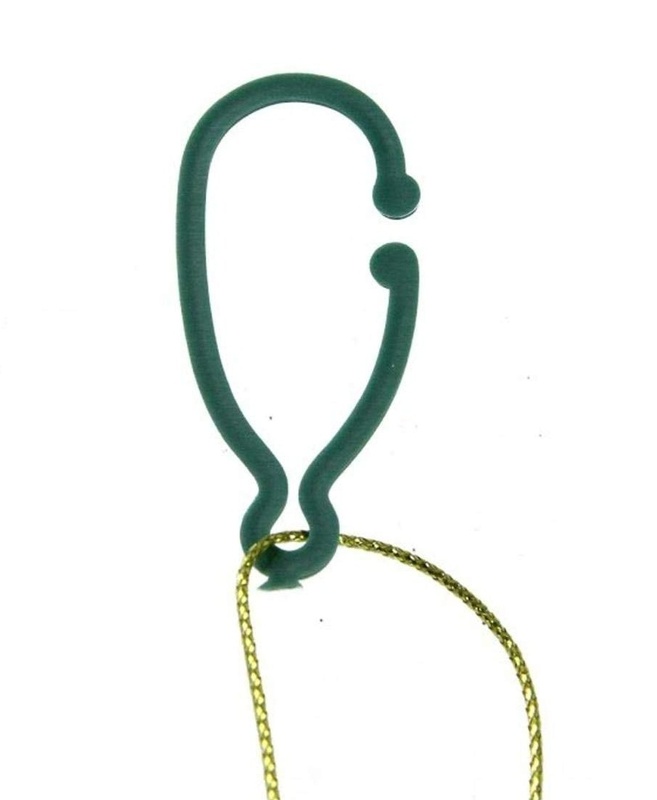 For hanging other ornaments higher on the tree, you can still use twist ties (still very tightly) or large plastic ornament hooks like these (picture inset). Also keep in mind that, like tinsel, if you hang shiny ornaments, cats are more likely to be curious about them. Either don’t use shiny decorations, or put them well out of reach. It’s great to try things that will keep your cat away from the tree, but it’s also good to have a backup plan in case they succeed at climbing it. Make sure you have a strong, steady support for your tree. Get a tree stand with a wide, stable base that is less likely to topple over from the added weight and jostling of a cat. This is the stand I use and it's very sturdy! You should also try to place the tree away from furniture, perches, staircases, etc. that your cat might use as a launching pad to jump from. Thankfully no animals, people, or furniture were harmed when this Christmas tree fail took place. Even if you’ve taken every precaution, curiosity will often get the better of a cat who doesn’t have anything better to play on. Cats instinctively seek out tall perches where they can lounge safely and survey their surroundings. And despite their usually lazy demeanor, they also have extra energy that needs to go somewhere, like climbing or playing. This means you should provide them with a stimulating environment where they get the scratching time, playing time, and climbing time they need. Try picking up some cat stands and other tall perches that your cat can claim as their own by scratching and rubbing to imprint their pheromones. More good news, your cat won’t mind if you cheat a little and give them their gift early, like a good-quality cat tower. Introduce and get your cat excited about the cat tower around the same time you bring your Christmas tree into your home, this way your cat will be more likely to be intrigued and interested in their new cat tower as opposed to your new tree. Especially if you train them to the cat tower and use the new FELISCRATCH pheromone from Ceva to help attract your cat to their new playground. If your cat just won’t leave the tree alone no matter what you do, consider putting it somewhere they can’t access, using either a closed door or baby gate to block off that area of your home. Alternatively, you can block off your tree from your cat by using an exercise pen like this one or these adjustable gates to protect the tree from your cat. 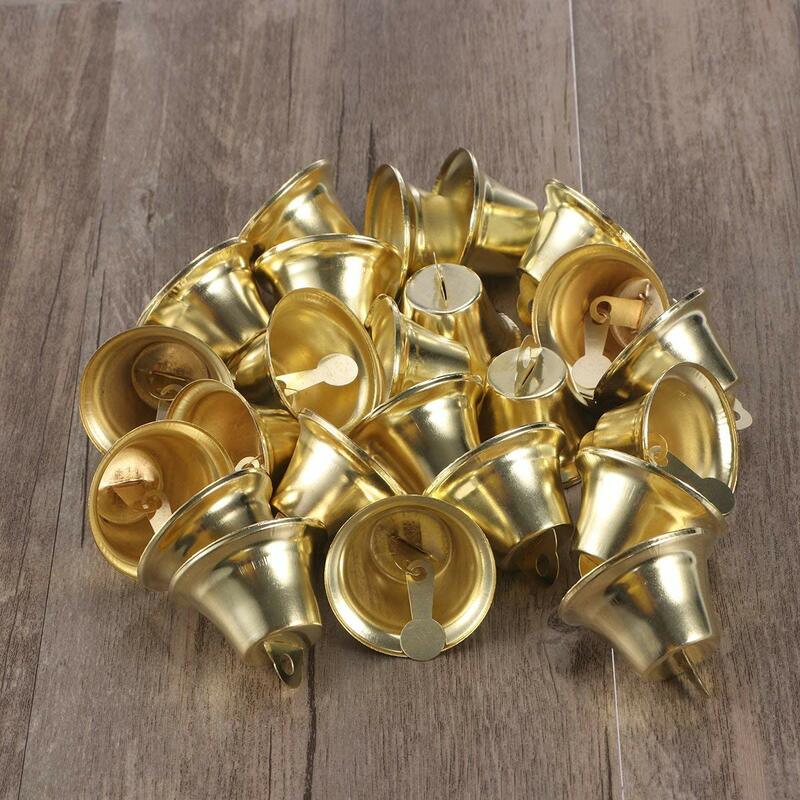 I like these dog/door bells, because they're in a line with a strap, so they can be laid across a few branches and tucked into the tree, and I like the second choice below (photo inset) because they're individual, so that means you can spread them throughout your tree. If you keep a tree in your home, don’t use tree preservatives, which can contain high concentrations of fertilizer that will be dangerous if your cat takes a drink of tree water. Some people also use aspirin to extend the life of their tree — DO NOT DO THIS IF YOU HAVE CATS. Aspirin is what's called a Non-Steroidal Anti-Inflammatory Drug (NSAID), and while there are a few conditions where cats may be prescribed low doses of aspirin (but only on the advice of your veterinarian), if your cat ingests enough aspirin from your tree water, which can happen, they could suffer bleeding and ulceration of their stomach and intestines. And be careful to cover, protect, or hide light cords. Cats will happily chew on the wires, resulting in a severe shock and perhaps even sparking a house fire. If it's difficult to put the light cords out of reach, try a combination of bitter sprays and cord covers to prevent your cats from chewing on them. (Just don't spray directly on the light cord, rather spray a cloth and then wipe the cord with the cloth.) Or you can use cat-safer rope lighting. 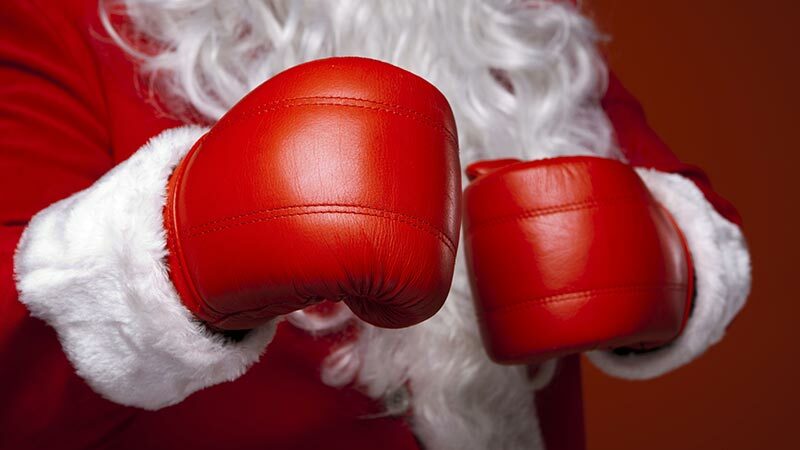 Got any of your own cat-proofing tips for Christmas or other holidays? Let us know in the comments below!